Turtles are easy to recognize reptiles that are famous for carrying their house on their back. They are often portrayed as slow-moving and dim-witted in stories and cartoons. But they are faster and more intelligent than given credit for! In Kentucky, we have 14 species of turtles. All of our turtles are aquatic and live in water except for one, the Eastern Box Turtle. Turtle is the common name for our friends with a shell. Technically tortoises are turtles that live on land and terrapins are fresh water turtles. Turtles are reptiles and belong to the order Chelonia, which comes from the Greek word for turtle, chelone. They are ectotherms (cold-blooded) which means their body temperature changes based on the surrounding environment. Like other reptiles, turtles breathe air and lay soft, leather-like eggs. During the winter months, turtles hibernate, or more accurately they brumate. Brumation is an adaptation that allows cold-blooded animals to survive lower temperatures. During this time heart and respiratory rates drop and the animal becomes lethargic. In Kentucky, our box turtles will dig down in a burrow under the ground to protect themselves from the extreme winter temperatures. Aquatic turtles, like our Red-eared Slider, also brumate but interestingly, they do so under the water. The slider will dig down into the mud at the bottom of the pond. Their body functions decrease to a point that they need very little oxygen to survive. In the spring, turtles come out of brumation and start moving around. They see that blacktop road as a nice warm pathway! If you see a turtle crossing the road, and you can safely pull over, you can give them an assist. Take them into the direction they were going and put them down facing away from the road. Remember to wash your hands after handling a turtle. 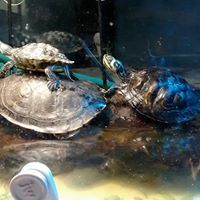 Turtles have a homing instinct which you can read about in our blog There Is No Where Like Home. Box Turtles live in fields and marginal woodlands. Aquatic turtles spend the majority of their time in the water typically in slow-moving rivers and ponds. They do come out to sun themselves, lay eggs and may travel overland to seek another water source. Eastern Box Turtles are territorial and often live within 1/2 mile of where they were born. Removing a box turtle from its territory causes confusion, inability to find food sources and conflict with other turtles. 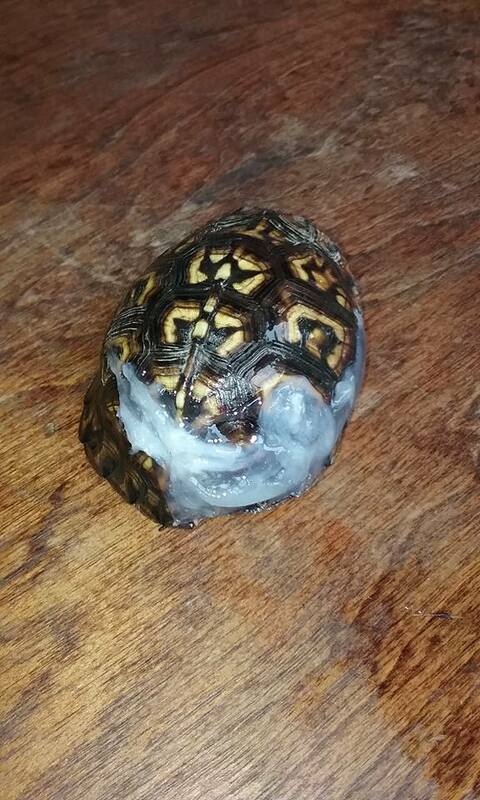 So "rescuing" that box turtle from an urban area and taking it 10 miles away to grandpa's farm is actually causing the turtle more harm than good. They have a dome-shaped shell. The top is called the carapace and it is made of bony plates that are fused to the underlying ribs and vertebrata. (This is why, contrary to Hannah Barbera, turtles can not walk out of their shell). Many people think the turtle does not feel pain and sometimes people are cruel and carve words in the shell. The shell has blood vessels and nerve endings so a broken shell does cause the turtle pain. The bottom part of the shell is called the plastron which connects to the carapace. The plastron has hinges in front and back which allows the turtle to pull in his body and be protected. That in addition, to his domed body shape help protect himself from predators. Kentucky has 13 species of aquatic turtles. Many live in Western Kentucky in and along the tributaries and lakes of the Mississippi watershed. The Red-eared Slider lives in ponds throughout the state and is often the turtle you see relaxing on a floating log in the sun. They have a red slash on their checks thus their name. The Snapping Turtle has a bad reputation since it can act in an aggressive manner when provoked. However, the Snapping turtle plays an important part in our local ecology. Snappers are omnivores and play an important role in keeping their water environment free from debris. Like other turtles, the eggs from the Snapper provide food for many other species. Kentucky currently monitors six species of turtles for conservation efforts due to habitat loss, water pollution, and population decline. 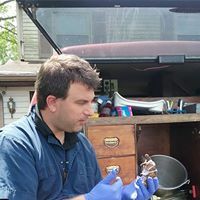 The Smooth Shell, Alligator Snapping Turtle, and Mississippi Map Turtle are rare in Kentucky and the Eastern Mud Turtle, False Map Turtle, and the Midland Smooth Softshell have been in decline. Many turtles such as the Red-eared Slider are declining in number due to the pet trade. In the United States, it is illegal to sell a turtle if the carapace is less than 4 inches in length. In Kentucky, it is illegal to remove turtles from the wild and keep them as pets, buy or sell them. It is also illegal to remove turtles from the wild and use them in turtle races. One problem we have in Kentucky deals with the African Spurred Tortoise. This tortoise from the Sahara Desert in Africa is popular in the pet trade. What people do not realize is that they are the third largest land tortoise and grow to 150 # and measure 30 inches across. This species requires specialized food, temperature, and space. If you look at the picture below, this tortoise has a problem called pyramiding. Pyramiding is the abnormal development of the shell. It is caused by poor care, malnutrition and improper environment. 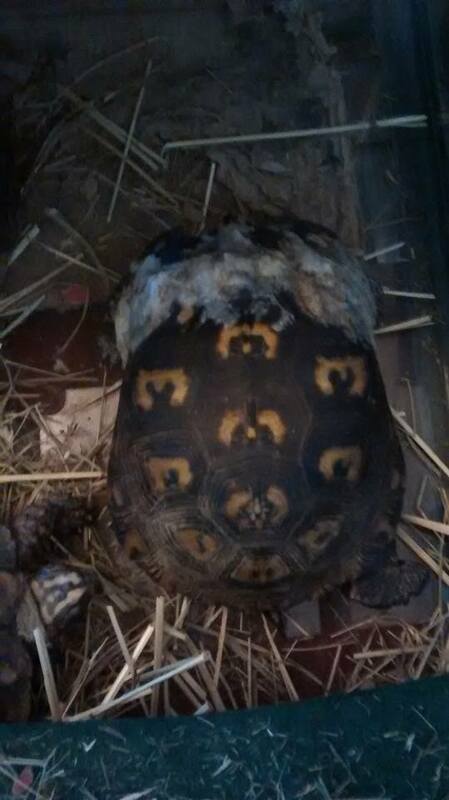 In Kentucky, it is a common problem for these turtles to become abandoned along the roads. This is an African Spurred Tortoise who was found by our Fish and Wildlife Officer wandering the roads. He was taken to Arrowhead Reptile Rescue in Cincinnati. Turtles are usually not a threat to the live fish in your pond. They eat mainly dead fish but some species eat the fry, or baby fish. Snapping turtles may eat young waterfowl. Sometimes turtles can become overpopulated in a pond and cause problems if they are eating too many fish or young waterfowl. Turtles can be caught in a trap and relocated to another pond. Kentucky Fish and Wildlife offers some solutions to pond problems. The biggest turtle was an Alligator Snapping Turtle that weighed 316 lbs. This outdoor box turtle enclosure was made for us by Girl Scout Troop 1830. Now our Eastern Box Turtles can enjoy being outside during the summer months! At Fox Run Environmental Education Center we provide wildlife rehabilitation for 5 - 10 Kentucky turtles every year. As we all know, turtles have a crossing the road obsession and are frequently run over by cars. I have worked with my vet, Dr. Glaza, on finding best practices to glue, staple and clamp our friends back together. We have had lots of successful turtles who have been able to be released. Membership saves lives. Please consider becoming a member to help us save turtles. The turtle population in Kentucky and all over the world has been dramatically reduced by the pet trade. Read our blog Kentucky Turtles – slowly walking towards extinction? Please do not remove turtles from the wild. It is a selfish act. When turtles are removed from the wild they can no longer behave naturally which not only means taking away their freedom but not allowing them to reproduce and thus continuing to lower the population. There are many turtle and tortoise breeds which are legal to own. Do your homework! Research how big the animal will get. If you live in an apartment a larger breed is not practical. Turtles often have very exact humidity and light needs. Make sure you can provide for them in the manner that is best for their health and happiness. Most of all make sure you buy from a licensed breeder to ensure that your new friend has not been removed from his natural home. Even better adopt a turtle that has been abandoned or surrendered. Arrowhead Reptile Rescue in Cincinnati has many reptiles in need of good homes. 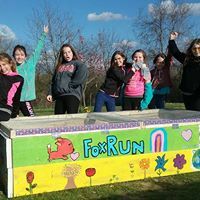 Ame Vanorio is a freelance writer and the founder/director of Fox Run Environmental Education Center in Falmouth, Ky. We teach environmental education programs and serve as a licensed wildlife rehabilitation center. Text us with wildlife emergencies at 859-242-1037. Older PostFall Gardens Are the Best!